Another blue plaid shirt! This time with a slight brown accent, and the dark blue running only horizontally across the shirt. 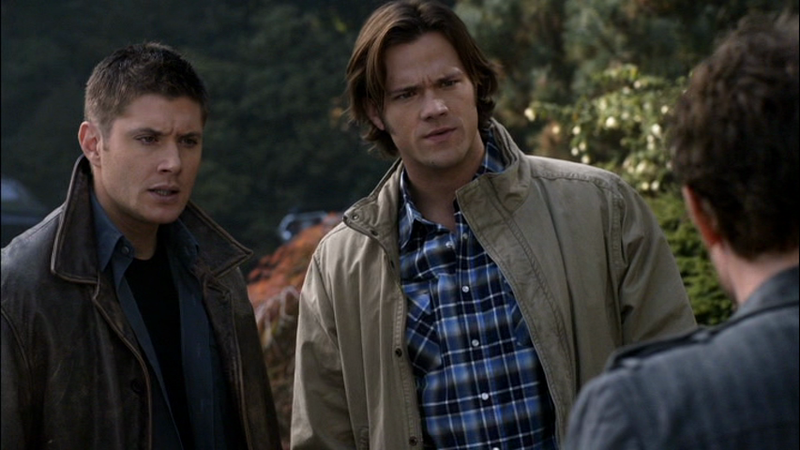 Like mostly all of Sam’s shirts, it does up with snaps, not buttons. Sam wears it in The Real Ghost Busters (5x09) from the beginning of the episode until the ghosts are vanquished. In Live Free or Twi-Hard (6x05), Sam wears it at the end of the episode when they are packing up the motel room and then getting into the car. In Mommy Dearest (6x19), Sam wears this shirt for the entire episode. 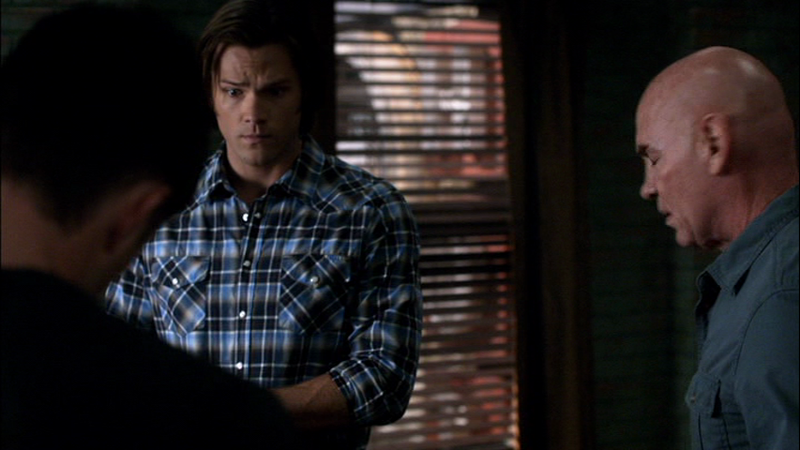 In Hello, Cruel World (7x02), we see Sam wearing this shirt from the time he gets the news about the swim-team and sends Dean out to investigate until the end of the episode. In Everybody Hates Hitler (8x13), Sam wears this shirt the morning after being attacked by the necromancer when he, Dean, and Aaron, are looking at the Red Ledger. He wears it until the after the Necromancers are disposed of. In Soul Survivor (10x03), Sam wears this shirt for the entire episode, with the exception of the opening scene when he is disguised as a doctor. In Dark Dynasty (10x21), Sam wears this shirt when they get back from Omaha until the end of the episode. In The Prisoner (10x22), Sam is still wearing this shirt at Charlie’s funeral at the beginning of the episode. In Somewhere Between Heaven and Hell (12x15), Sam wears this shirt when they go into the woods to hunt the Hell Hound with Crowley. He wears it until the end of the episode.